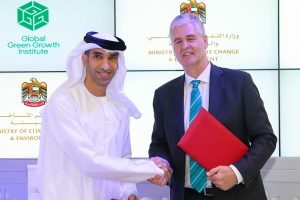 DUBAI, UAE – October 24, 2017 – The United Arab Emirates (UAE) and the Global Green Growth Institute (GGGI) signed a Host Country Agreement (HCA) during the World Green Economy Summit, thus cementing GGGI’s local presence in the UAE and the Gulf region. The signing ceremony was held after the opening of the summit with the presence of H.E. Dr. Thani bin Ahmad Al Zeyoudi, Minister of Climate Change and Environment and Dr. Frank Rijsberman, Director-General of GGGI. “The signing of the HCA clearly demonstrates the UAE’s commitment to strengthen collaboration with GGGI to facilitate the UAE’s transition from hydrocarbon toward a diversified, knowledge-based economy, serving as a green growth model for other oil-rich countries,” said Dr. Rijsberman. The HCA solidifies the legal status of GGGI’s Regional Office in the UAE. It provides immunities and privileges for GGGI staff to help them perform their official functions. Since 2011, GGGI has positioned itself as a strategic partner of the UAE through the establishment of the GGGI Regional Office in Abu Dhabi, which serves as a regional hub for green growth policy and capacity development in the Middle East and Africa region. GGGI provided critical support for the development of the National Green Growth Strategy, which was endorsed by the Cabinet in 2015 as well as the recently approved National Climate Change Plan. Moreover, GGGI has also completed numerous knowledge sharing and capacity building workshops on green growth for students and young professionals in the UAE. Through GGGI, the UAE has been providing assistance to other countries in the region such as Morocco and Jordan. Currently, GGGI is implementing several initiatives in the UAE namely the National Program for Climate Change Adaptation, Air Quality Monitoring, Green Jobs Assessment, Sustainable Public Procurement, and Youth Development Program, in line with GGGI’s Country Planning Framework and UAE Vision 2021. Based in Seoul, GGGI is a treaty-based international, inter-governmental organization founded to support and promote green growth. The organization partners with countries to help them build economies that grow strongly, are more efficient and sustainable in the use of natural resources, less carbon intensive, and more resilient to climate change. GGGI works with countries around the world, building their capacity and working collaboratively on green growth policies that can impact the lives of millions. To learn more about GGGI, see http://www.gggi.org and visit us on Facebook and Twitter.